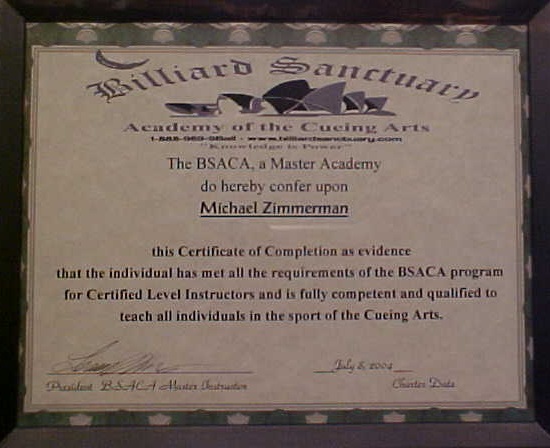 We offer certified billiard instruction thru our Cue School and we can come to you! Our course is designed to provide a solid foundation for the beginning pool player, enhance the abilities of the intermediate level players and take each player to the next playing level. Instruction is offered by the hour, by the session (6 hours) or an entire course (5 sessions). Each session is completed over 2 days during 1-2 week(s), while the course is conducted over a 30 day period. Spreading the course length out with days between allows the student to take what they learned and practice it on their own time in their own environment and then discuss any issues at the next scheduled time period, thus allowing the student to feel more comfortable while practicing. This is designed for small groups or teams of beginner and intermediate skill level that want to get a solid foundation of the basic fundamentals to help them improve both as a individual player and a team. $50 per person! Limited to 8! $25 pre-registration to reserve a spot! ** 4+ students- 40% off per student. More than 4 students are allowed; however, the time is not increased, which may cause some students not to be able to reach the full potential of the subject matter being taught. - Has taught several students in private lessons, video anaylsis and thru the Cue School Weekend.